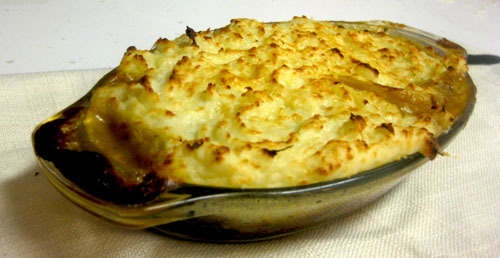 Growing up, shepherds pie was a concoction of flabby mashed potato and seasoned beef mince under. Sorry Mum, I loved all your other food but I could never get behind shepherds pie. I had a half a joint of roast lamb sitting about left over from dinner last night. After some sandwiches I wondered what I could do with it. I remembered that Shepherds Pie was originally concocted as a use for leftover roast lamb and mashed potato (hence the name). I suggested it to my husband and he recollected the same memories as mine of the dish – no matter how much HP sauce you douse it in. However, as I dig a good use of leftovers I proceeded to make it. My plan was to make a delicious shepherds pie. I was hoping I wouldn’t fail. What I ended up with was a rich meaty gravy with bit tender hunks of roast lamb, peppered with homey aromatic vegies, topped with a fragrant potato-parsnip mash. It was perfectly rustic and delicious. Now when you make this, don’t go out and buy all the ingredients. The whole point of this dish is that you need to use what you have. I’ll let you know the stuff you can’t skip, the rest is up to what your fridge will yield. Make the mash fresh if you don’t have it, I’ll allow that, as that’s what I did! Americans, if you don’t eat lamb (you should), I would imagine this would work really well with leftover pulled pork or shredded roast beef. Add a splosh of red wine during cooking if you’re using beef. But don’t call it shepherds pie – maybe ranchers pie is better. 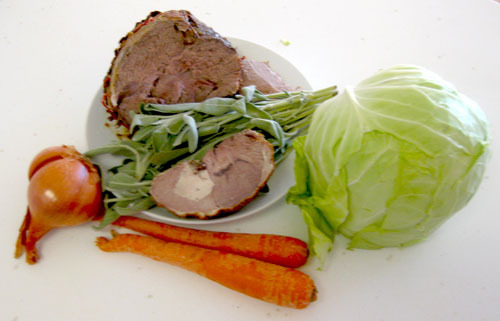 approximately 1 pound (1/2 kilo) of leftover roast lamb, leg or shoulder is perfectly adequate. Finely chopped, as much as you can be bothered. 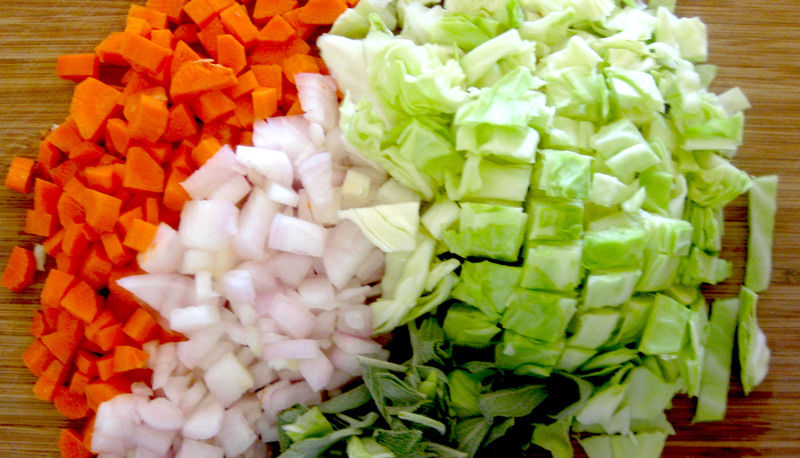 1-2 cups of any kind of vegetable you have left in the crisper. Things that work well: Cabbage, Peas, Spinach, Eggplant, Broccoli. 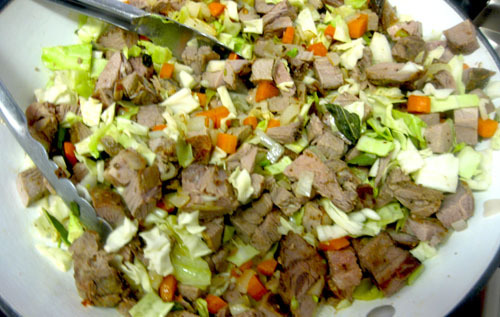 Dice it as finely as you diced the lamb. If you don’t have mashed potato left over, peel and dice the your root vegetables (even mix of potato and parsnip for me) and peel 3 garlic cloves. Cover with cold water, add some salt and bring to the boil. Boil until they are really soft. Mash with 1 tablespoon of butter and enough milk to make a loose mash. Loose is better as it won’t dry out as it’s baking. In a large skillet, heat the cooking oil and sweat the onion and carrot and whatever fresh herbs you have over low heat for about 2 minutes. Add the lamb and turn the heat up so that it browns slightly. Season with salt and pepper. Add the flour and stir until it starts to form a bit of a crust on the bottom of the pan. Pour in the stock and deglaze, stirring and scraping the brown bits off the bottom of the pan to create a rich sauce. Tip in the vegetables. Add a bit of water if it seems dry. 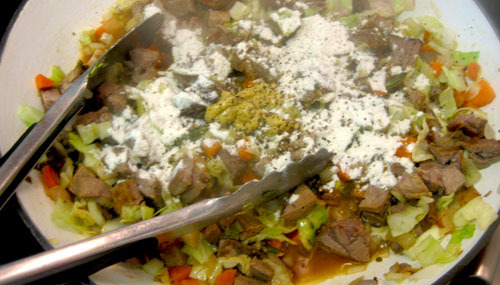 Taste for salt & pepper and simmer until the lamb starts to break down a bit. This will only take a couple of minutes. You want the sauce to be thick and not hugely runny, so if it is, simmer a little while longer until it reduces to the proper consistency. 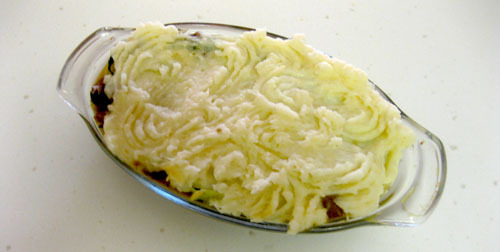 Tumble the mixture into a casserole and top with the mashed potato. Dot the top with a little bit of butter and bake in a 350F/180C oven until brown on top and bubbling. Serve with ketchup if you must but I don’t think it needs it.